There are plant of events happening at Vivid Ideas in Sydney. 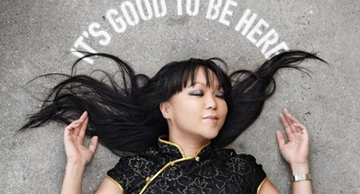 One event of interest is Candy Chang: On Making Art to Make a Difference. Empower yourself (and your community) with ideas and tools to transform your town. Candy Chang is an artist and urban designer from New Orleans, renowned for creating artworks that bring together communities on a neighbourhood level, with a resonance that achieves a global impact. Through the activation of local public spaces, she inspires new ideas for space, place and community; using art to motivate people to provide immediate feedback and re-imagine the places they live. Her interactive work Before I Die was first painted on an abandoned house in her neighbourhood and has been re-created in over 60 countries, while I Wish This Was inspired people in Los Angeles and New Orleans to visualise an alternative future for their city streets. Candy was one of the founders of Neighborland, an online project to spread this forum for feedback across the USA. Policy-makers, curators, planners, urban designers, architects, community activists and social entrepreneurs – join us to learn how Candy Chang motivates and inspires communities around the world. *Booking and transaction fees apply.